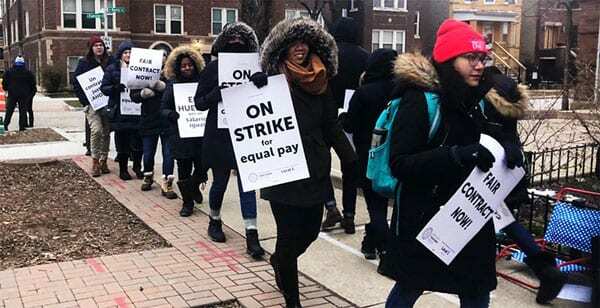 By going on strike, the teachers of Chicago’s 15-school Acero network took a step once limited to traditional public schools and began a new era for the nation’s growing charter school sector. When, after a week of walking the picket lines, they settled with the network’s management on very favorable terms, their union may have neatly helped to eradicate one of the arguments for charters in the first place—that is, the ability to work outside the strong influence of the greatly maligned teachers’ unions. Charter schools today are a key component of education in the US, having operated in some cities for more than two decades. Reformers have encouraged the growth of charters as part of a strategy that believes the power of an open educational marketplace will drive educational improvement. In 44 states, charters receive public funding and are free from the rules and obligations traditional public schools must fill. They are operated by independent, quasi-public organizations, many of which are nonprofit. Many advocates for expanding charter schools and reducing the reach of traditional public schools have viewed teachers and their unions as a major barrier to educational progress. So, in the charter community, teachers and support staff have traditionally been non-unionized, salaries are significantly lower than those in the adjacent public schools, and the voice of teachers when designing the educational experience has been diminished. With the conclusion of the Acero strike, these differences may begin to crumble. Charter operators are creating a second tier in the teaching profession. Your job at a charter school, your pay, benefits, your rights, your ability to speak up for students, all these things are way below [public school district] standards…I would say this strike is the opening salvo, the beginning of a wave of militant unionism in defense of our students in the charter sector, where for a long time the assumption was, “Well, you work for a charter school, your interests must be the same as the charter operators’ interest.” That is in fact not the case. Our interests are students’ interests and charter operators’ interests are business interests, and that contradiction is coming to a crisis point and becoming very clear in these negotiations.